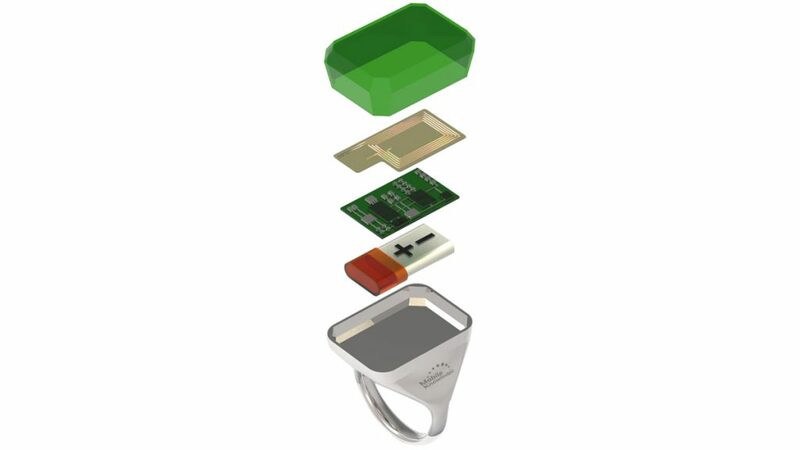 MK100 is a reference platform with full integrated NFC-secure functionality, and small enough to be embedded in a ring. MK100 features NXP Semiconductors PN66T IC, a tamper-proof, banking grade secure element + NFC controller, to enable the easy provisioning of any secure contactless applications. This NFC secure element is already present in many NFC smartphones supporting payment applications. Pay at any contactless point of sales worldwide. Include pre-certified VISA, Mastercard, Amex, Discover and PBOC applets. Access to the hundreds of banks that have already rallied the Payment Network Operators' tokenization platforms on a continually growing worldwide basis. Using the PN66T allows OEMs to benefit from NXP’s Open Secure Element (Open SE) functionality. This enables the device to be securely OTA (Over-The-Air) provisioned from the Tokenization Service Platforms (TSP) of the Payment Network Operators (PNO), via the bluetooth connection of the customer’s smartphone to their wearable device. Avoid expensive set-up and maintenance of an SEI-TSM provisioning platform. Open SE includes Loader Service and MIFARE® Open Platform functionalities. Whenever you want, download all your preferred payment cards to the device. Add your transport, office or gym access cards. And you manage them all from your mobile phone companion application. Multiple banking cards in one device. Multiple MIFARE® cards in the same device. Both MIFARE® Classic and MIFARE® DESFire EV1 supported. Additional applets such as authentication credentials (eg. FIDO). MK100 brings a white label platform for hosting multiple payment, transport and secure access NFC cards in a light, compact module small enough for a ring! No additional wireless charging IC, since the solution is using the same NFC antenna for innovative cost-optimized charging from a simple NFC reader device. The integration of contactless secure applications with wearable devices is a very significant new business opportunity for hardware and service providers. MobileKnowledge’s extensive experience on mobile NFC applications, plus its in-house testing facilities, allows it to help OEMs with certification, software development, and final implementation of MK100 in any wearable device.